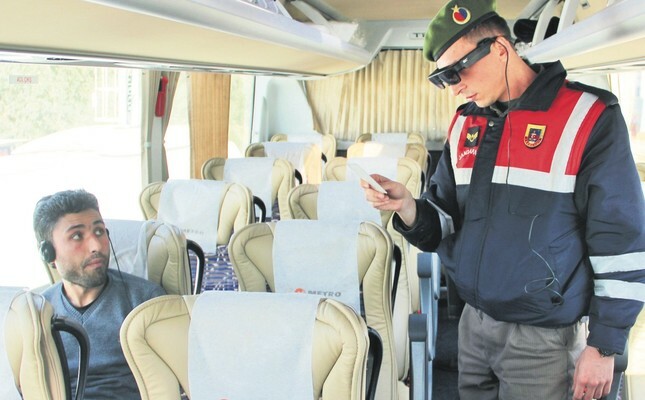 A gendarme checks the ID of a bus passenger with Takbul goggles. "Takbul" (roughly translated as "Wear-Find") is the latest gadget at the service of the Turkish gendarmerie and is nothing short of the sci-fi goggles of part half-robot, half-human "Robocop" from the famous movie franchise. It was in a serene Mediterranean town where it made its debut, a far cry from the violent, dystopia Detroit of the film series. Through Takbul, officers can scan a database of convicted criminals and suspicious, wanted people by just taking a glance at their faces or IDs. The goggles can also be used to scan license plates. Developed by a team of Turkish scientists and retired soldiers, the technology aims to speed up the security check process and bring a rapid response against security threats. Through a mobile network via SIM cards used in cellphones, officers in the field can be linked to the Smuggling, Intelligence and Operations Database of the Interior Ministry. The screen turns red if the scanned person has a search or arrest warrant or if a license plate is fake or registered to another vehicle and a message pops up on the screen about the criminal record of the person. The goggles can also be voice activated if the user scans the database for a person or a license plate if they are unable to make eye contact. Although it is currently used in conventional checkpoints on roads connecting towns at the moment, the authorities plan to employ the goggles to scan large crowds against suspects. Currently, security forces have only 20 goggles and security personnel are trained in the capital Ankara. In Bodrum, a gendarmerie officer fitted with a Takbul entered a bus carrying tourists and it took only a few minutes to complete an ID check of the passengers. Previously, officers had to collect IDs one by one and scan them on computers in their patrol car. It only takes one second to scan one ID and find out if its holder is a wanted suspect. "I have been through three checkpoints on my way from Ankara to Bodrum and had to wait for minutes. Here, it took only five seconds. I am surprised," Elçin Görgün, a retired engineer who was stopped at a checkpoint in Bodrum by gendarmerie officers, told Doğan News Agency. Görgün says he hopes more goggles will be delivered to officers at checkpoints so that motorists will not have to wait. Officials said 10 goggles were also delivered to the Turkish National Police along with Muğla, the province where Bodrum is located. The goggles will go into use in nine provinces.